There are two types of Bipolar Junction Transistors (BJTs), namely, NPN and PNP. Here we look at the NPN transistor used in the tutorials. 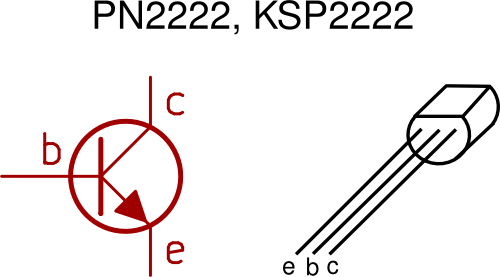 The NPN transistor symbol used in circuit diagrams is shown on the left in the diagram below. The NPN transistor symbol has an arrow pointing out. The PNP symbol has an arrow pointing in. 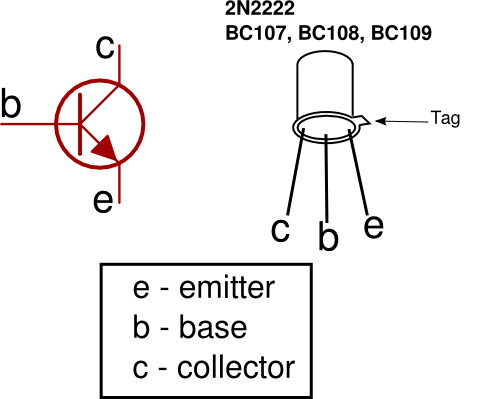 BJT transistors have three terminals called emitter (e), base (b) and collector (c). Pinout in electronics refers to the mapping of pins from the component's symbol to its physical pins, or location and names of the component's pins.